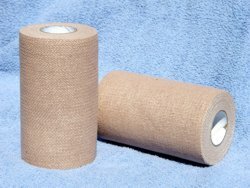 One of our veterinarian bandage supplies. This stretch tape offers the highest tension strength, yet allows it to conform to every contour and wrap area. The 100% cotton fabric allows for movement without constriction. The tape keeps the wrapped area cool and comfortable to wear 24/7.